In terms of social media and employment, the First Amendment does not apply. You can get fired because of social media. You can get fired for what you write, post and share on social media. In 2015, 18% of employers said they had fired an employee for something they posted on social media! Most people don’t know that. 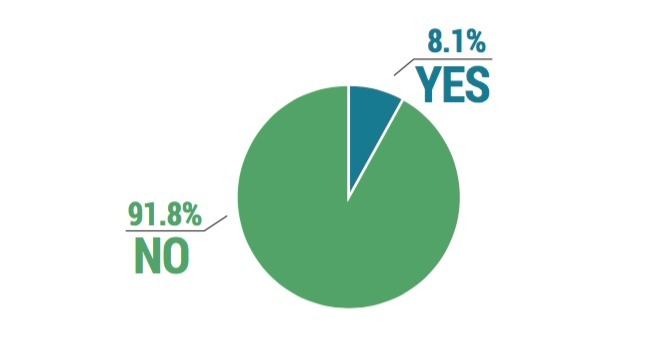 In our June 2016 Social Media Conduct Survey, we asked, “Do you believe that getting fired because of a social media post is an infringement of First Amendment rights?” 41.2% of Americans said “Yes,”—they believe that getting fired because of a social media post is an infringement of First Amendment rights. 30.4% say they’re “Not Sure.” That’s 71.6% who do not fully understand the risks of posting their unfiltered thoughts on social media. is an infringement of First Amendment rights? 41.2% are sure that they can post whatever they want, no matter how ugly, and they can’t lose their jobs. They believe they are protected by their First Amendment Right to Free Speech; with very few exceptions, they are dead wrong. The First Amendment Right to Freedom of Speech allows individuals to express themselves without interference or constraint by the government. Speech is not protected from private sector disciplinary action. If you get fired because of social media by a private sector employer, citing your First Amendment right to Freedom of Speech is futile. As this Rolling Stone article attests, stories of people who got fired because of social media posts abound. It happens to high profile people. It happens to ordinary people. You cannot depend on the right to free speech when it comes to social media and employment. Granted, employers should have a social media policy for employees, but many don’t. An employer does have the right to fire you because of social media even if the company has not provided a written social media policy for employees. Companies that do have a social media policy for employees must be sure that the policy complies with NLRB rulings. Anthonia Akitunde, founder of Mater Mea, recommends that every company have a social media policy for employees and it should include the five elements that she’s outlined in this article. Perhaps it’s less surprising to learn that the First Amendment offers no protections to people who haven’t yet been hired. 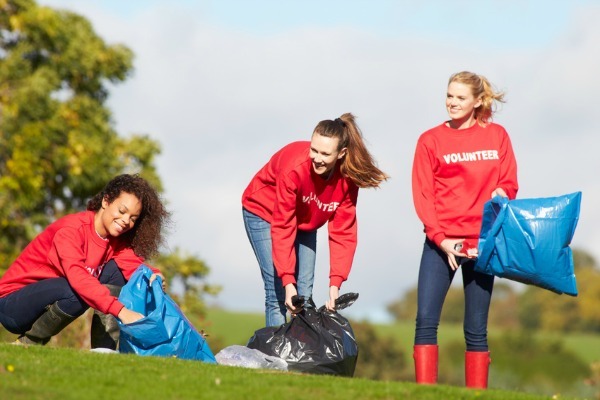 Employers can and do research job applicants on social media. Job seekers should always think in terms of social media and employment aspirations because the two are so closely connected. A survey by careerbuilder.com revealed that 49% of hiring managers who screen candidates via social networks said they’ve found information that caused them not to hire a candidate—more proof that social media and employment are intertwined. A hiring manager can look at your social media and other information that comes up about you online and decide to toss your resume or your application aside. You may never know that those photos of you and your friends at a party, or that angry political rant you posted cost you a job. What people may be surprised to learn is just how many employers are using social media to screen job candidates. 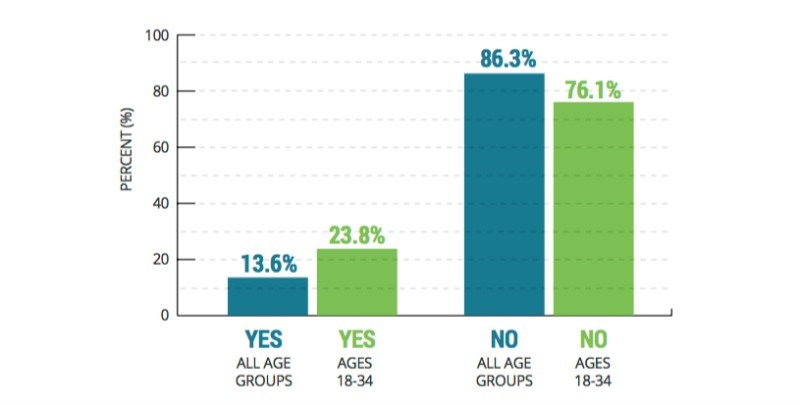 According to JobVite, 93% of recruiters say they use or plan to use social media for hiring. Employers primarily look at LinkedIn (92%) Facebook (66%) and Twitter (52%). There are some positive aspects to the trend of connecting social media to employment. According to Jobvite, one in three employers who research candidates on social media have found content that made them more likely to hire a candidate. 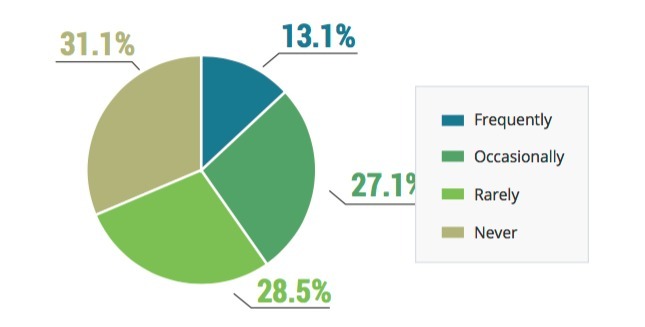 And, 23% found content that directly led to hiring the candidate. The trick is, then, to not avoid social media, but to be on social media and be thoughtful about what you post. Your social media profiles, or lack thereof, tell employers so much about you. JobVite found that 55% of recruiters have reconsidered candidates based on their social media profiles. 61% of those reconsiderations were negative. That means 39% were positive. Those who got a positive reconsideration likely put some care and consideration into their personal brand. Make sure you’re controlling your personal brand and building up your social media profiles so they tell your story the way you want it to be told. What Makes You an Employment Risk? According to Pew Research Center, nearly two-thirds of American adults (65%) use social networking sites, and 90% of young adults (ages 18 to 29) are the most likely to use social media. Certainly most of the people using social media are either looking for a job or want to progress in their careers. The Careerbuilder.com and Jobvite surveys prove that the manner in which a person represents him or herself on social media does matter a great deal to the people who make hiring and firing decisions. As a digital marketing firm that frequently recruits and hires marketing professionals, and understands the importance of personal branding, we wanted to find out if people are mindful of the damage that social media can do to a personal brand. We wanted to see how many are aware of the social media and employment connection and if people understand that they can get fired because of social media. We considered the types of social media posts that are a turn-off to employers and we surveyed people to find out if anyone is still engaging in those risky social media behaviors. 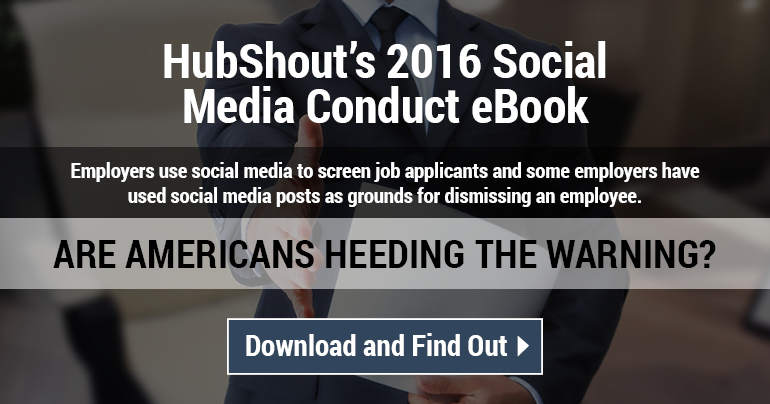 The full results of the survey are in the HubShout’s 2016 Social Media Conduct Ebook. Below are some of the highlights of the survey and stories to illustrate social media’s impact on employers, employees and job seekers. QUESTION: Do you ever post information or photos that could be offensive to others? Justine Sacco’s story is perhaps one of the most well-known cases of a person getting fired because of social media. Not only was she fired, but her entire life was turned upside down because of her thoughtless and insensitive social media posts. Wendy Bell’s supporters created a Facebook page called “Save Wendy Bell” where some expressed their misconceptions about the First Amendment, believing that an American cannot be fired because of social media; others argued that this was not an issue of Free Speech. 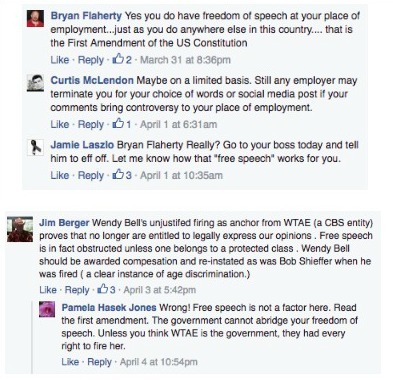 Some who weighed in on the “Save Wendy Bell” Facebook page do understand the social media and employment connection as it relates to the First Amendment, and others don't. Go Ahead, Be a Jerk on Social Media. Just Don’t Expect to Get Hired. 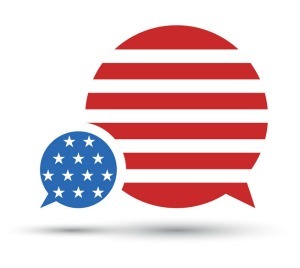 Certainly, every American has the right to post his or her opinions about anything and everything, so long as they adhere to the social media platform’s rules. 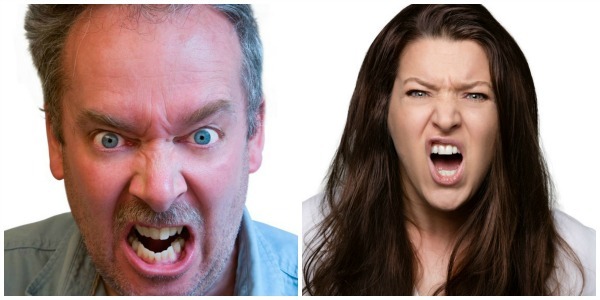 However, a person who goes into angry rants, especially about divisive issues like politics and religion, is likely to leave a pretty bad impression on a potential employer. Careerbuilder.com’s survey found that 33% of employers say they eliminate candidates who post discriminatory comments related to race, religion, gender, etc. According to our survey, 68.7% said they post comments and/or share content about divisive issues like politics and religion. 13.1% said they do so frequently, 27.1% occasionally, and 28.5% rarely. While posts of this nature may not be meant to offend, those related to race, religion, gender and politics can be interpreted by some as disrespectful or even discriminatory. divisive issues like politics and religion? 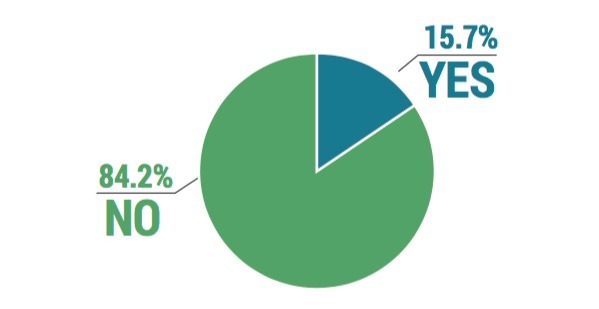 19.7% of people we surveyed said they plan to continue to post the kinds of things that might be a turnoff to potential employers because “I have the right to post whatever I want on social media.” Perhaps. But few employers are going to be inspired to hire people who give even the slightest hint that they may have anger issues, enjoy pushing people’s buttons, or are simply not nice. 5.8% said they are not worried about posting things that may be a turnoff to employers because “I wouldn’t want to work for a company that doesn’t like what I post on social media.” Apparently, this group does not concern themselves with the link between social media and employment. Fair enough. A social media page that makes your life look like a non-stop party is probably going to judged harshly. 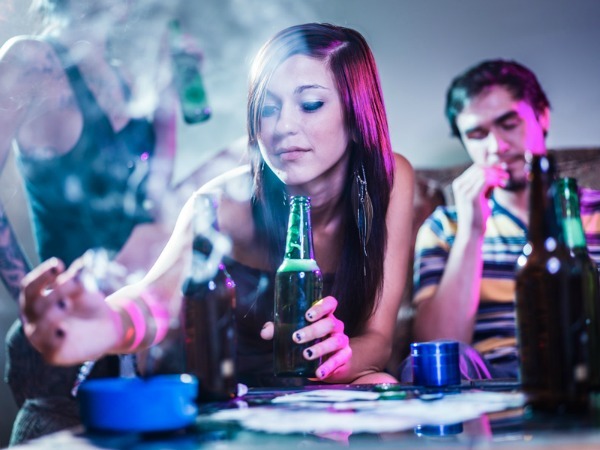 The careerbuilder.com survey indicates that 43% of employers are turned off by information about candidates drinking or using drugs. 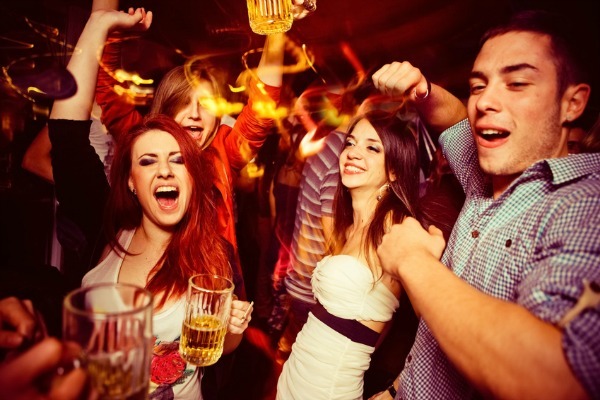 According to our survey, only 5.3% make the mistake of overdoing it with the party photos, and are likely to be judged as irresponsible and undisciplined. 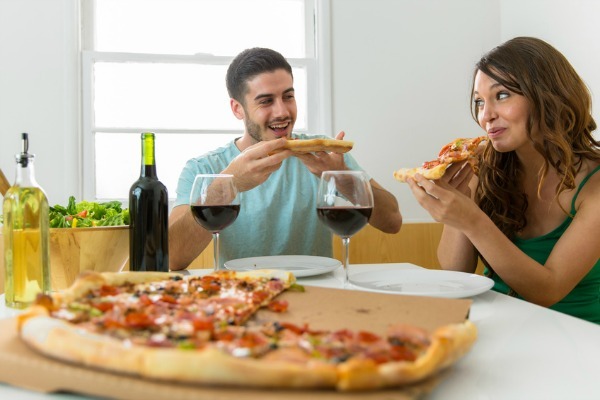 14.2% occasionally show themselves using alcohol, 17.4% rarely do and 26.9% never make that mistake. QUESTION: How often do you post pictures/videos of yourself using alcohol? The use of internet slang, texting language, poor grammar and misspellings is ubiquitous on social media and can signify poor communication skills. According to careerbuilder.com 29% of employers do not like to see posts that demonstrate poor communication skills. Our survey found that 5.8% frequently and 17.1% occasionally exhibit poor communication skills in their social media posts. 40.6% claim they do so rarely and 36.3% say they never do. slang and/or text language in your posts? Though 29% of employers are turned off by poor communication skills, the careerbuilder.com survey also found that 37% are more likely to hire a candidate whose social media profiles indicate great communication skills. So, a serious job candidate who showcases his or her strong communication skills by submitting a professional resume undermines that effort when his or her social profiles are littered with internet slang, poor grammar, and misspellings. It may not be a bad idea to keep up with trending internet slang words because today’s teenagers will soon be in charge. Gavin Hammar, CEO of Sendible.com, believes that "As this language becomes more allowed in educational settings, it will leave a lasting impact on the future generations. The young adults that are in high school right now are being directly affected by social media slang. These are the same people that will become the next business professionals, politicians and leaders of our world." But for now, it’s best to keep the internet slang to a minimum. And let’s hope that proper grammar never goes out of style. 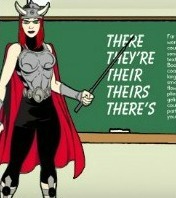 HubShout SEO Superhero Lady Jen, The Grammarian, will keep fighting the good fight. Seems that most people get that. Most don’t complain about their job, employer or colleagues on social media. 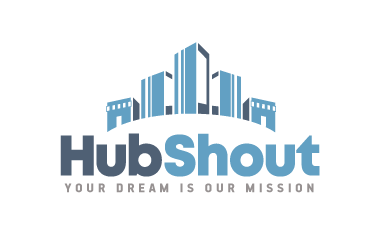 The careerbuilder.com survey found that 31% of employers eliminate candidates who bad-mouthed a previous company or fellow employee in their social media posts. Our survey found that only 8.1% of people said they’ve posted criticisms of their employers or colleagues on social media and 15.7%, have complained about their jobs. 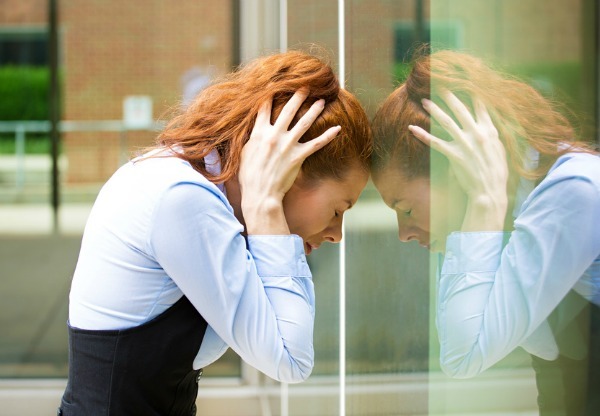 QUESTION: Have you ever criticized your employer or colleagues on social media? QUESTION: Have you ever complained about your job on social media? Perhaps they’ve read the cautionary tale of Kaitlyn Walls who on the first day of her new job posted this on Facebook: “I start my new job today. But I absolutely hate working at day care […] Lol, it’s all good, I just really hate being around a lot of kids.” She was fired because of social media. Most likely, her employer, a small daycare center, did not have a social media policy for employees. Shouldn’t any employee should know better than to share an “I hate my job” post without the guidance of social media policy for employees? You’d think. Or the one about Marine Sgt. Gary Stein who lost his job due to a Facebook post that read: “Screw Obama. I will not follow all orders from him.” Reportedly, he and his lawyers argued that he was only exercising his First Amendment rights. He later told the Associated Press, “I love the Marine Corps, I love my job. I wish it wouldn’t have gone this way. I’m having a hard time seeing how 15 words on Facebook could have ruined my nine-year career.” But they did. You have a job and want to keep it? Don’t want to get fired because of social media? Then don’t ever post anything negative about your job, your colleagues or your employer on social media. And if your employer has a social media policy for employees, read it! 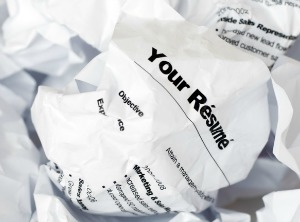 Follow the same advice if you don’t want your resume to end up in the trash—real or virtual. The career.com survey found that 31% of employers say they eliminate candidates who bad-mouthed their previous company or fellow employee. The advice in Mr. Kleinberg’s article is a must-read for job seekers, people who want to keep their jobs and anyone who uses social media. You can never be sure that your social media privacy settings are 100% secure. Never. There may be an illusion of privacy, but nothing on the internet is ever really 100% private. You can delete incriminating photos and potentially offensive posts, but once those things are out there, they’re out there. of someone's social media post to use it against him or her? 13.6% say they have! And in the 18-34 age group, 23.8% admit to having done it. Social media posts can come back to haunt you in so many ways. Even if you feel really confident about your social media privacy settings, that everything is locked down, what do will do when a hiring manager or recruiter wants to friend you? 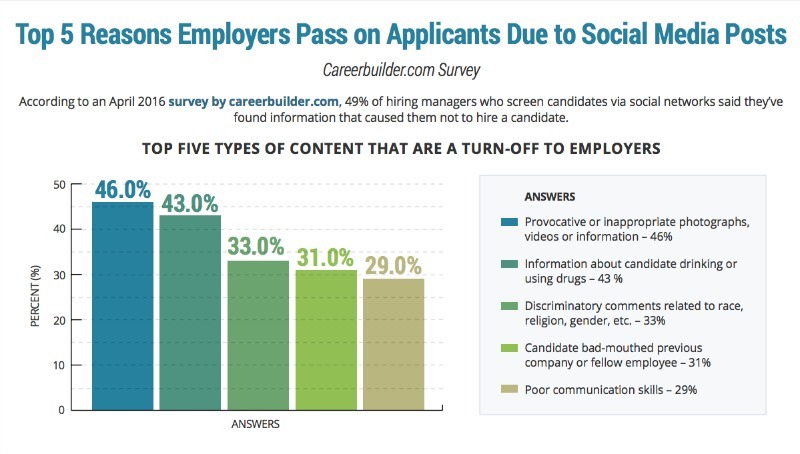 Careerbuilder.com found that 36% of employers who screen via social networks have requested to “be a friend” or follow candidates who have private accounts. Of that group, 68 % say they’ve been granted permission. Declining that request is going to look a little suspicious—i.e, what are you hiding? So you’ll have to decline and appear suspicious, or try to erase years of posts and hope that they don’t show up when the employer goes digging around on the internet. Robert Fulghum makes many good points in his bestselling book All I Really Need to Know I Learned in Kindergarten. Here’s one to remember when you’re posting on social media: “Sticks and stones may break our bones, but words will break our hearts.” And get you fired. And exclude you from being considered for a job. Always think before you post, be mindful of your personal brand and don’t get fired because of social media.